Friends, this is a good day. 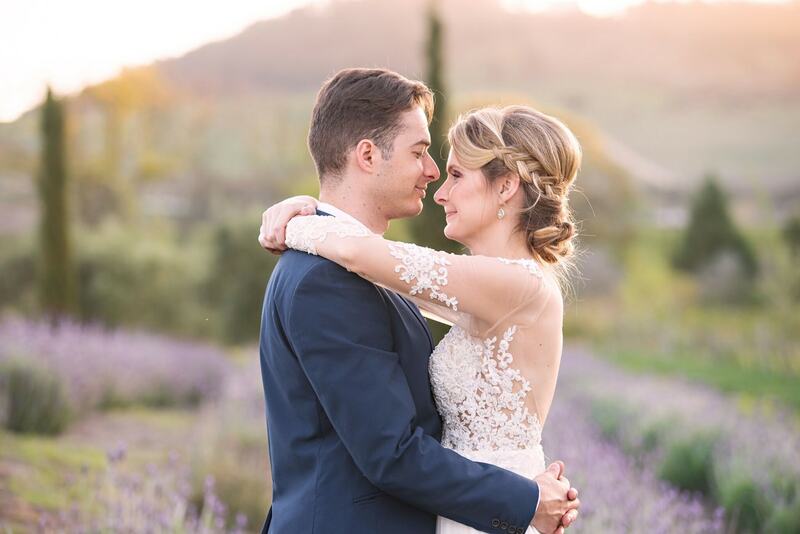 I not only get to share this BEAUTIFUL styled shoot, the last of the series in our Fine Art Weddings month, which will absolutely send you into fits of swoonage with its painterly prettiness and impressionist charm, but I also get to introduce you to an exciting new friend. 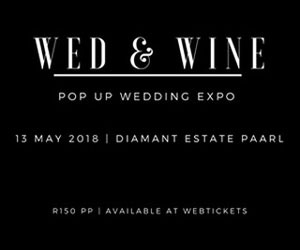 A few weeks back, I discovered the very lovely Mary-Ann Wiggill of Mary-Ann Art, who offers something really special and exciting when it comes to weddings: live art. 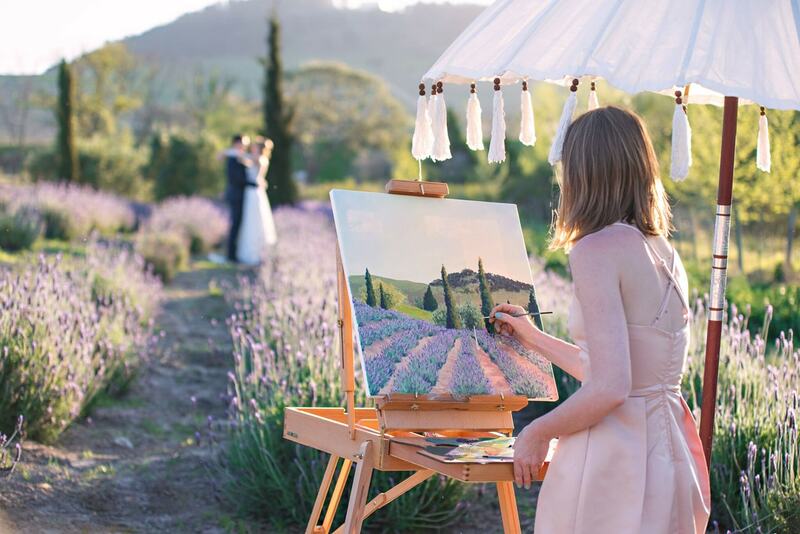 Working from the sidelines while your magical day is going on, Mary-Ann creates acrylic paintings that recreate a scene from the wedding. Can you imagine a keepsake more lovely than that? 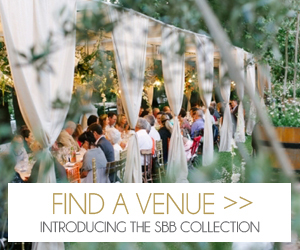 (Not to mention that your guests will get such a kick from seeing it happening!) 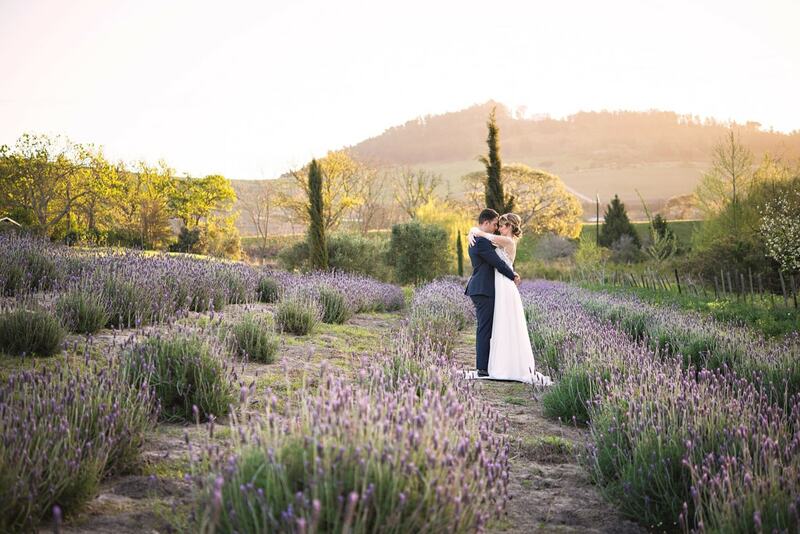 Today’s shoot has Mary-Ann in her element, capturing the romance of a couple in a field of lavender (we seriously could be in France right now) and includes even more gorgeous fine art-inspired details, like a hand painted cake, a floral gown, an artist’s palette a bouquet alternative (genius!) 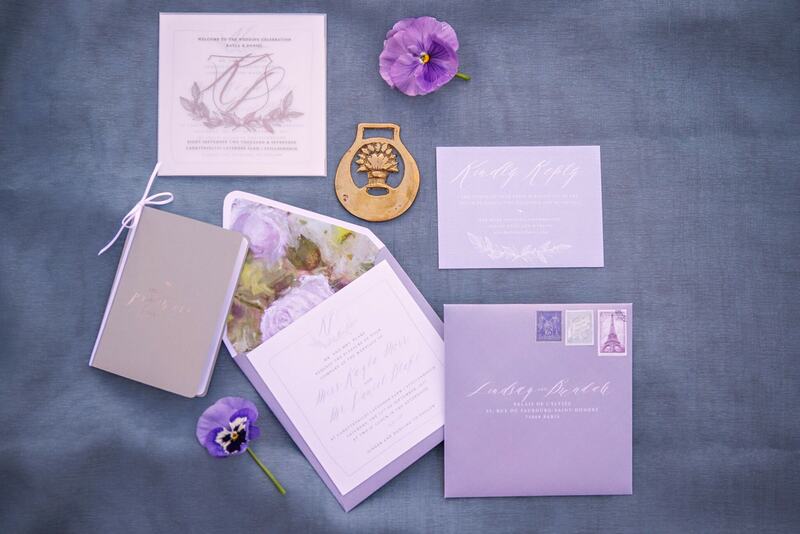 and the loveliest stationery by our talented friends at Blooming Wonderful, and of course dreamy images by Natasha Taljard. 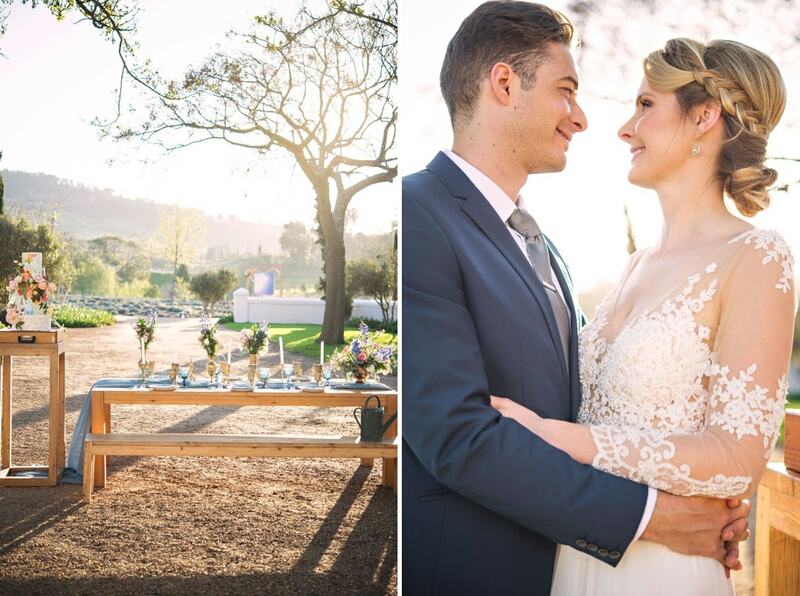 Which just goes to show: every wedding is a work of art, but some can be a masterpiece! 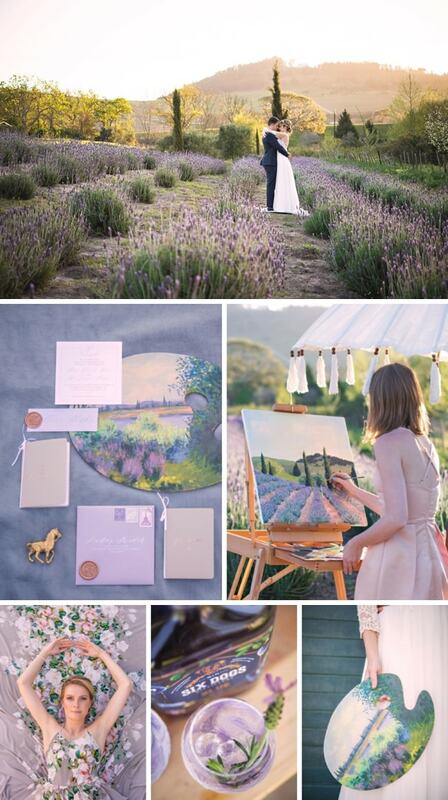 Inspired by the beautiful paintings of the Impressionist era, this shoot features multiple fine art wedding elements. 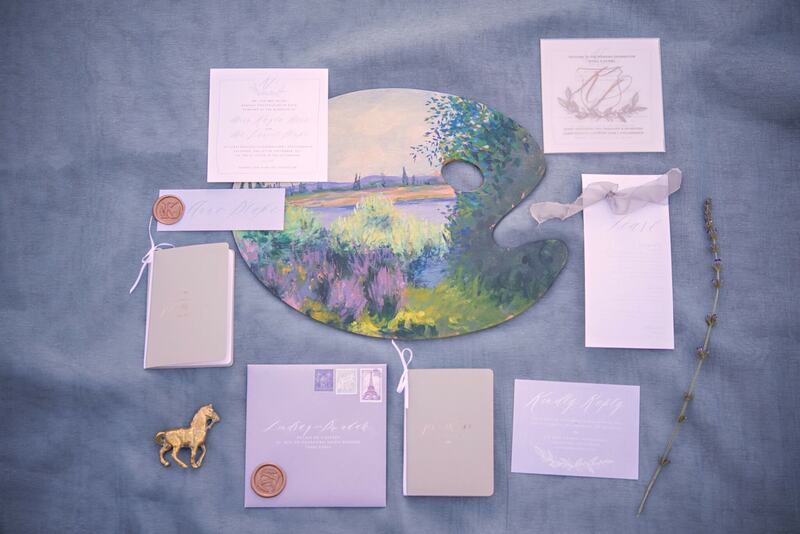 The details are also rich in references to the art of Monet and Renoir, including a painted palette as bouquet. 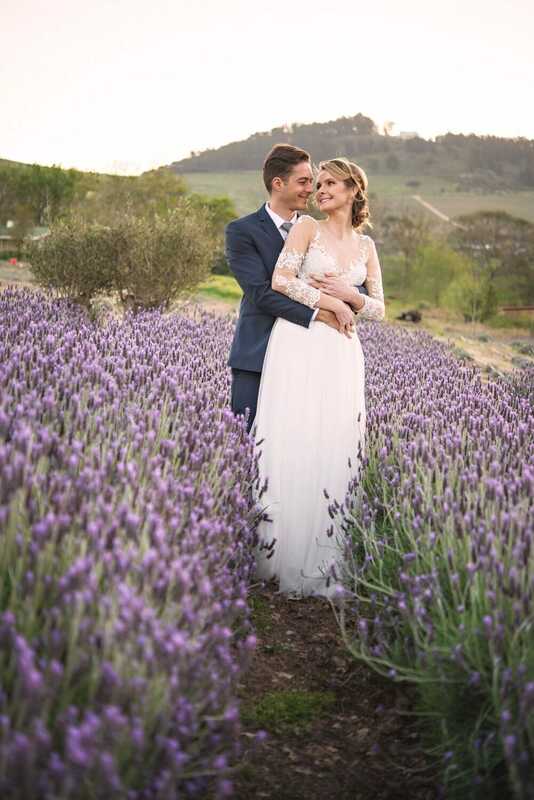 The shoot is set on a lavender farm, with a handpainted cake, fine art photography and a Live Wedding Painter who painted the couple at the scene of the shoot. 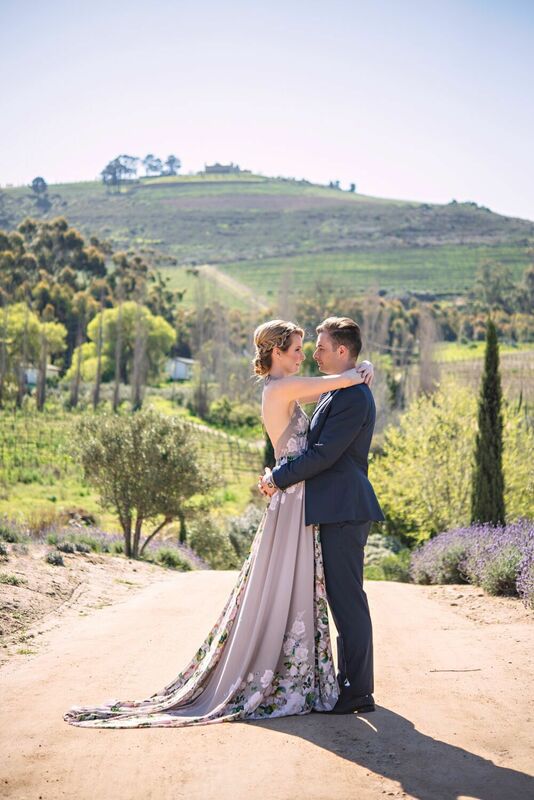 The florals were loose and natural, and only seasonal blooms were used. 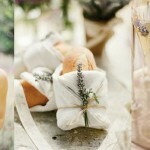 Moondrops created beautiful table florals in shades of white, pastel green, pale pink and indigo. 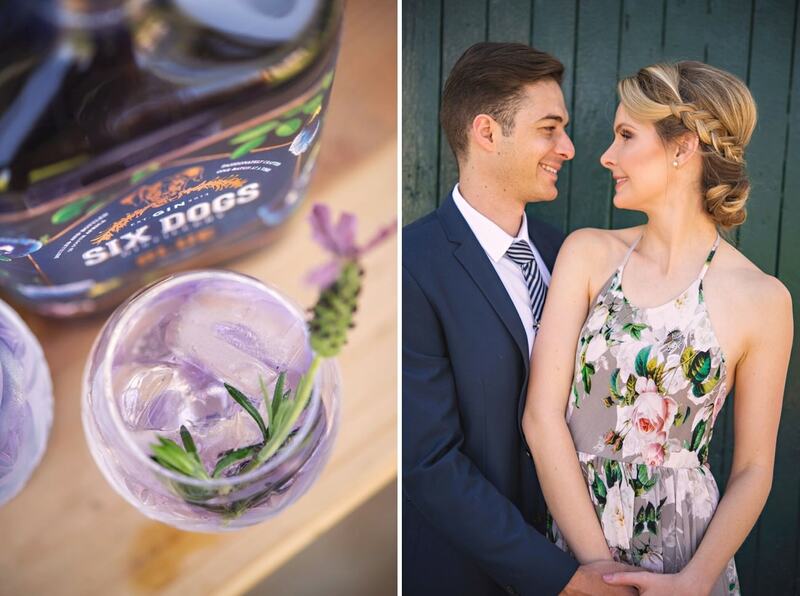 We also made use of fresh lavender to compliment the pastel and indigo blooms. 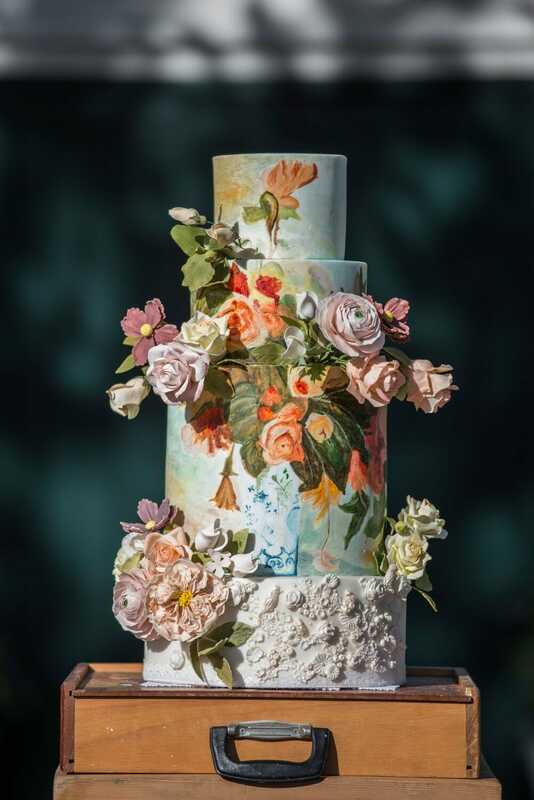 The cake was also truly a work of art, handpainted by Sumaiya and inspired by the paintings of Renoir. It was adorned with intricate sugar flowers, which were so lifelike that you can see the individual veins and ripples in the petals. The cake was displayed on an artist’s easel box alongside the main table and complemented the florals perfectly. 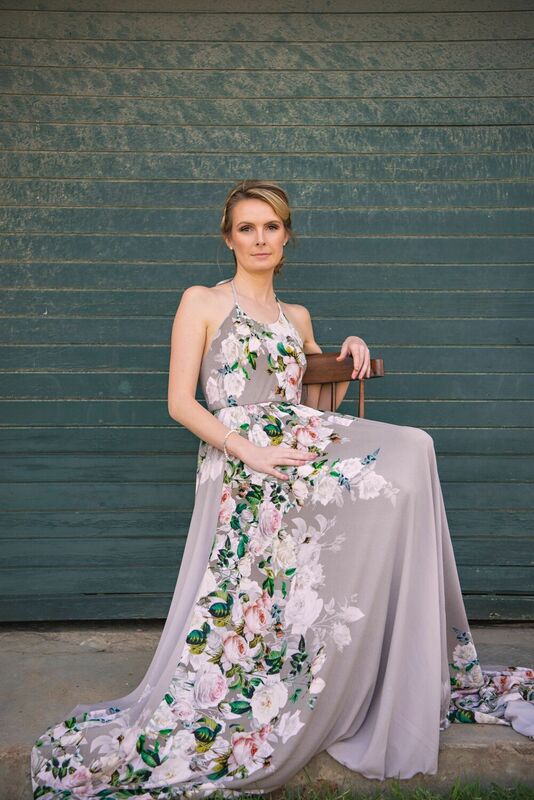 For this shoot, we made use of two dresses. 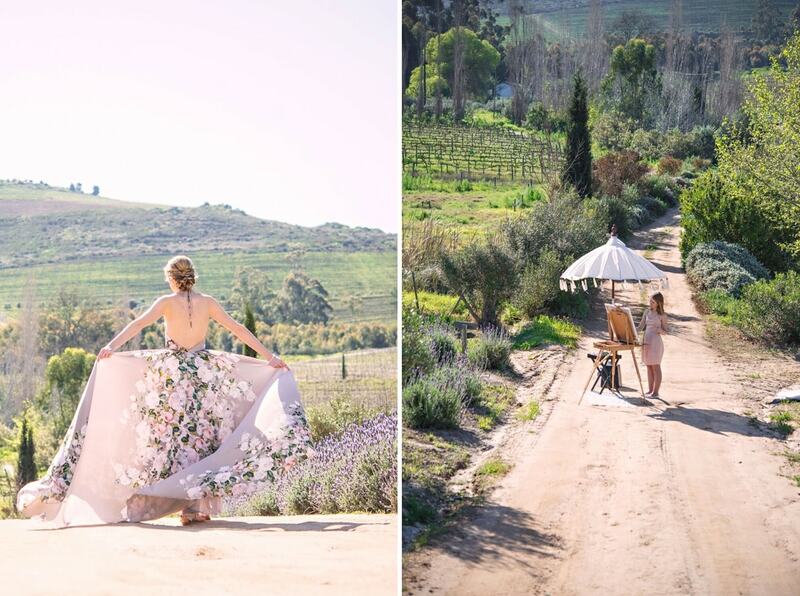 The first, by Silver Swallow Designs, was custom made for the shoot and inspired by the beautiful florals of the gardens painted by Monet and Renoir. 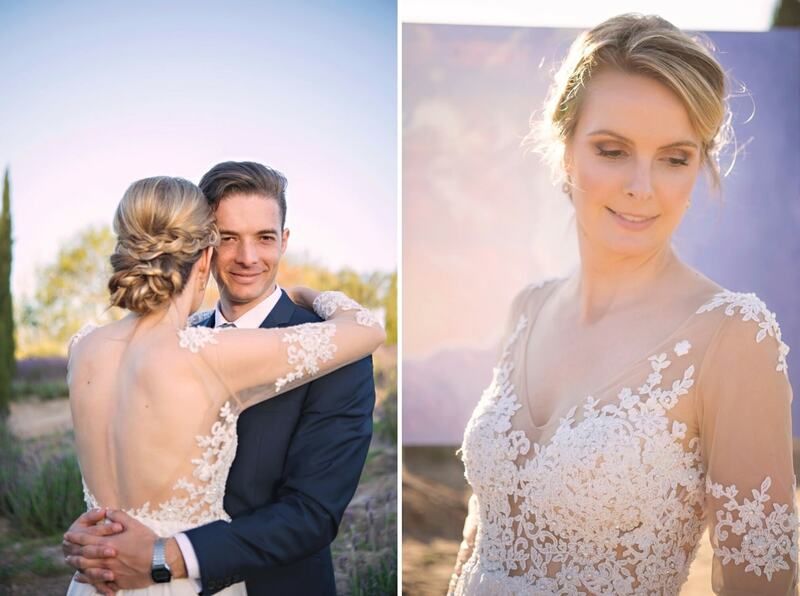 The dress flowed exquisitely and you can see from the breathtaking photos that it was a delight to wear. 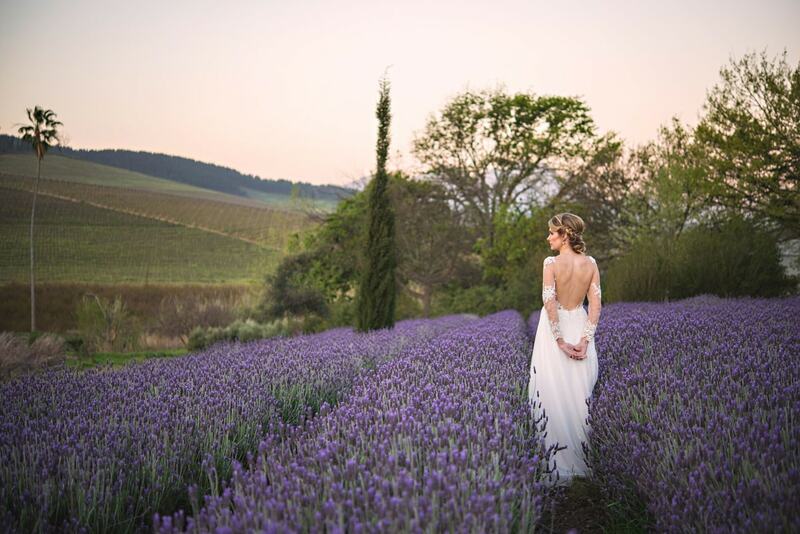 The second dress was handpicked from Molteno Creations’ collection, selected to perfectly capture the evening light. 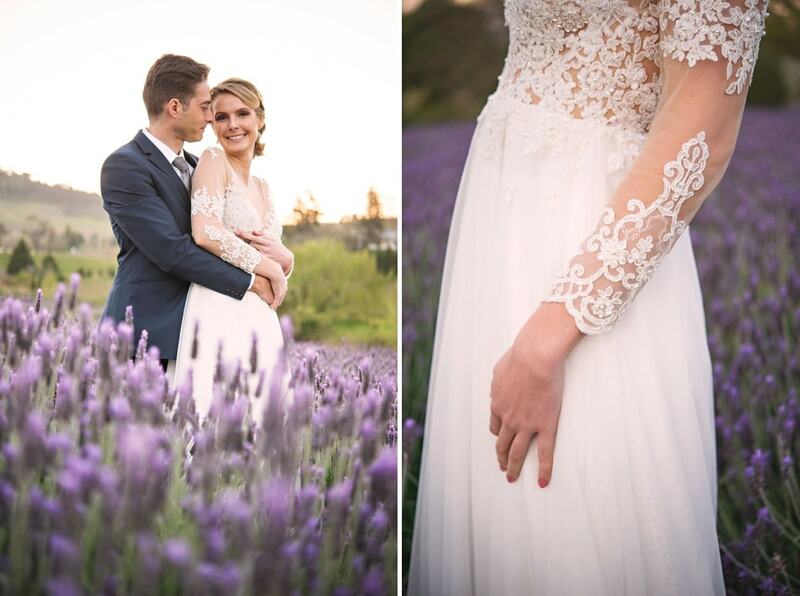 It was delicate and lacy and was a lovely complement to the lavender fields. 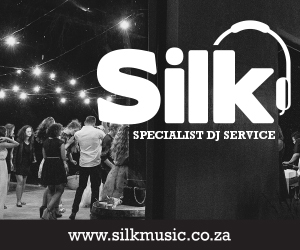 The groom wore a navy suit, in reference to the aversion of impressionist era artists to the colour black. 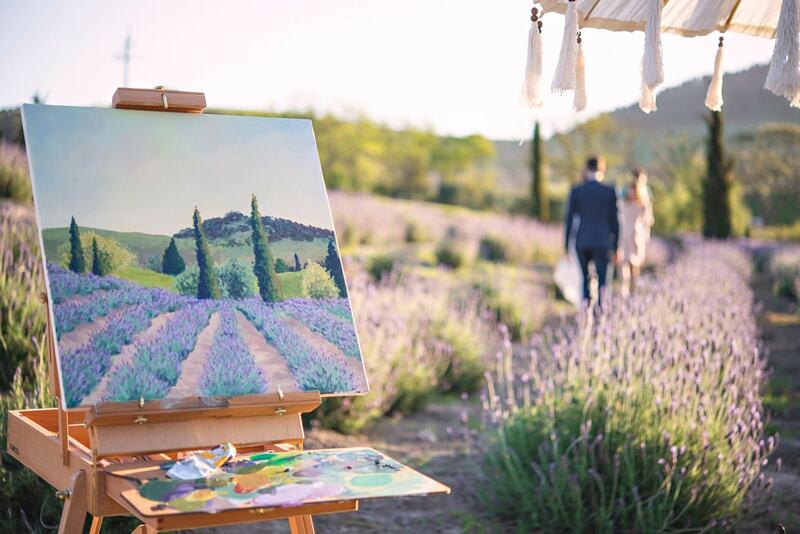 The focal item was the live painting of the couple in the lavender fields at sunset. 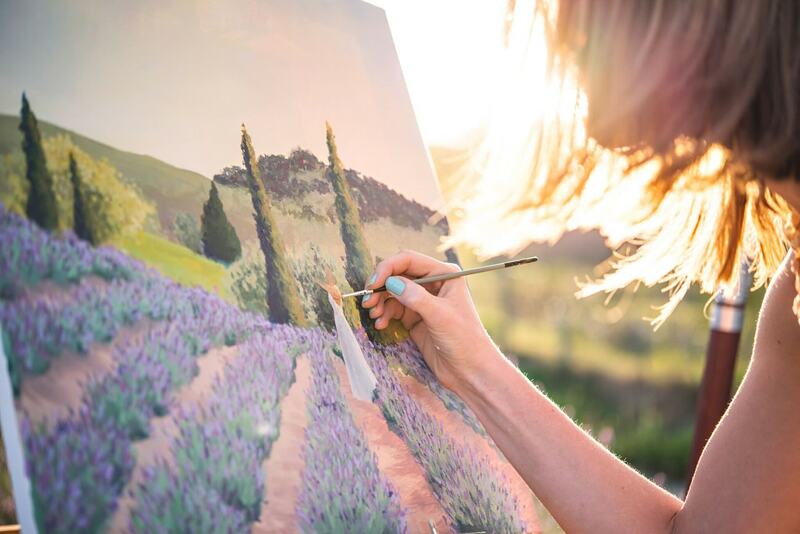 Mary-Ann captured the romance in an impressionist style painting on canvas. 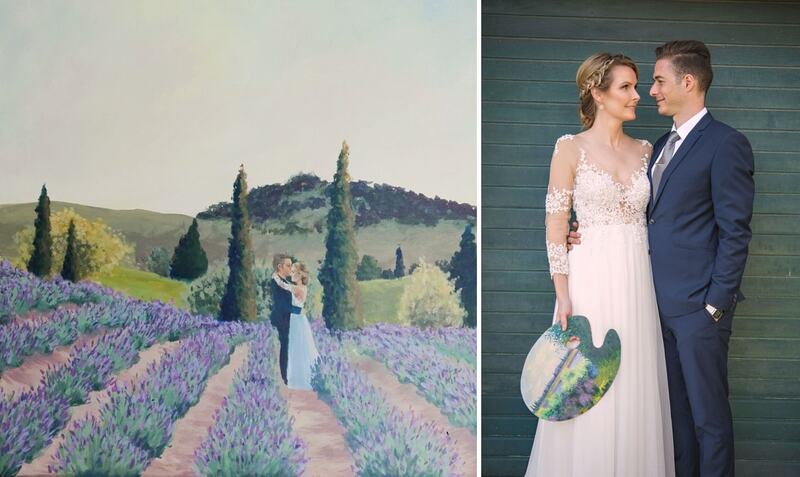 Mary-Ann specialises in live wedding painting and her work is heavily influenced by Monet. 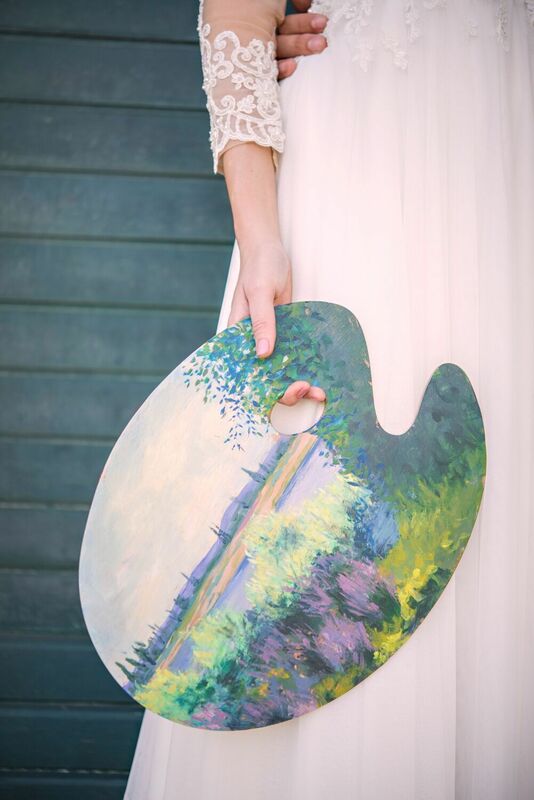 In tribute to this Mary-Ann also created a copy of one of Monet’s works on a palette, which was used as an alternative to the traditional bouquet. 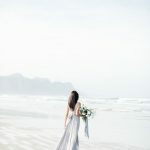 It was beautifully set off by the white of the wedding gown. Mary-Ann also provided her artist’s notebook to be photographed alongside the gorgeous stationery, created by Blooming Wonderful. 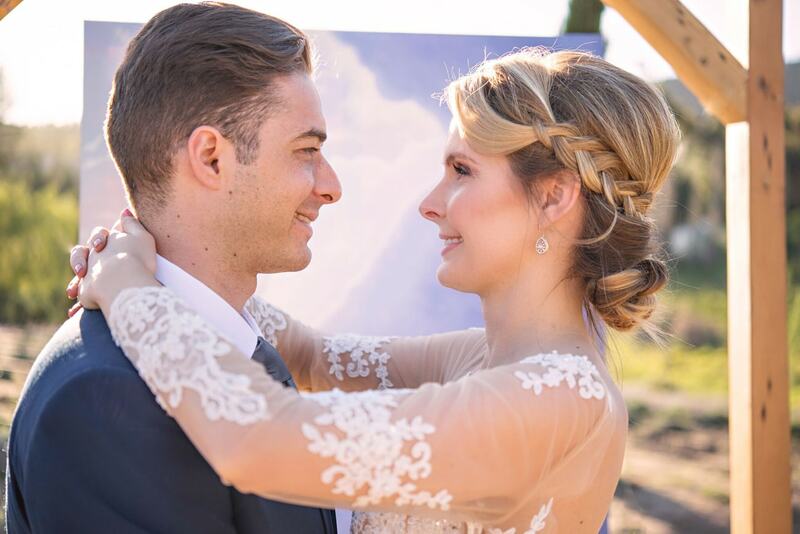 Whimsical and romantic, it included beautiful rose gold embellishments. 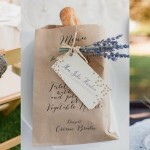 The tablescape palette was fresh and reminiscent of spring. 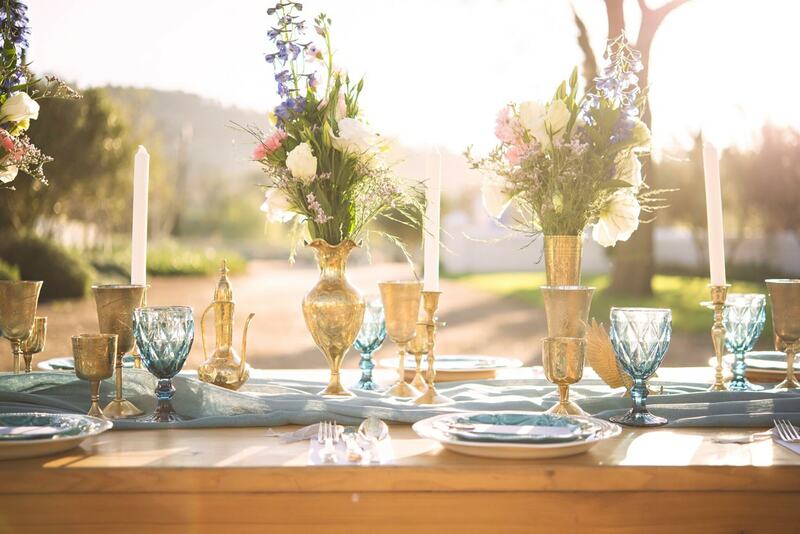 The table was adorned with a pale blue runner and brass ornamentation. The objects on the table are all found objects (artist’s own) making this a simple table to replicate. 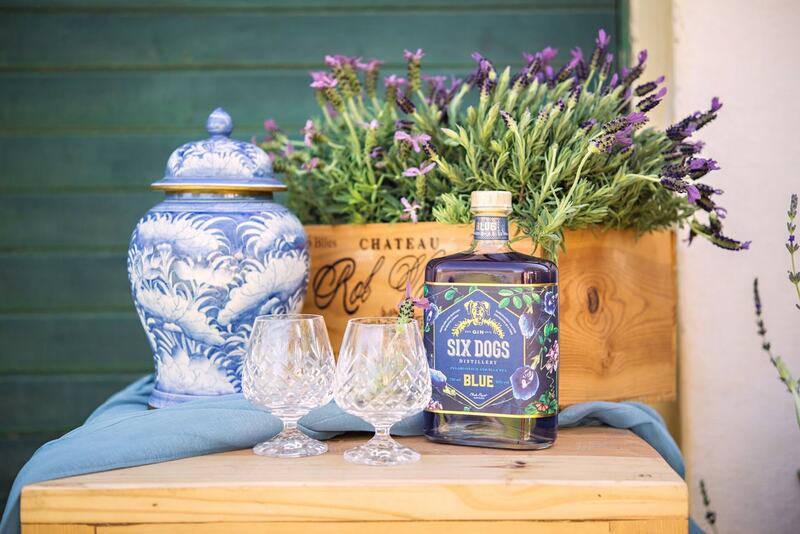 The bar table included a vintage wine box full of lavender plants and a pale blue urn serving as ice bucket. 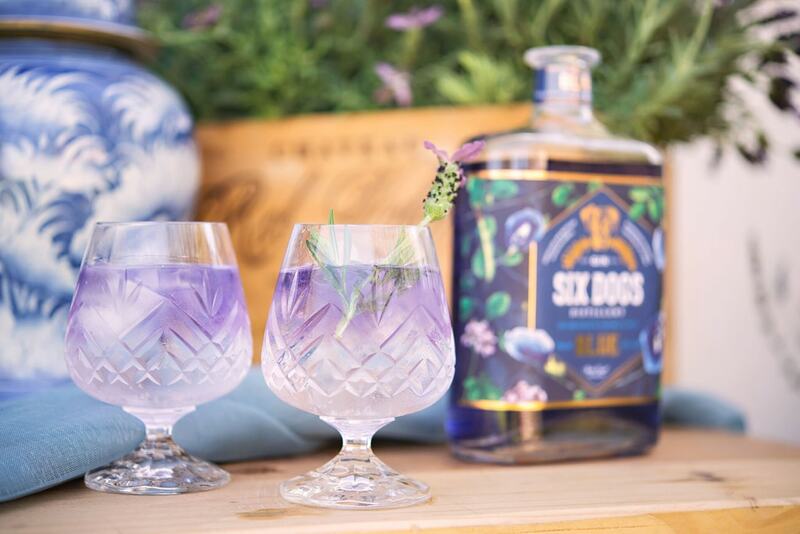 The indigo of the lavender worked well with the stunning Six Dogs Blue Gin. 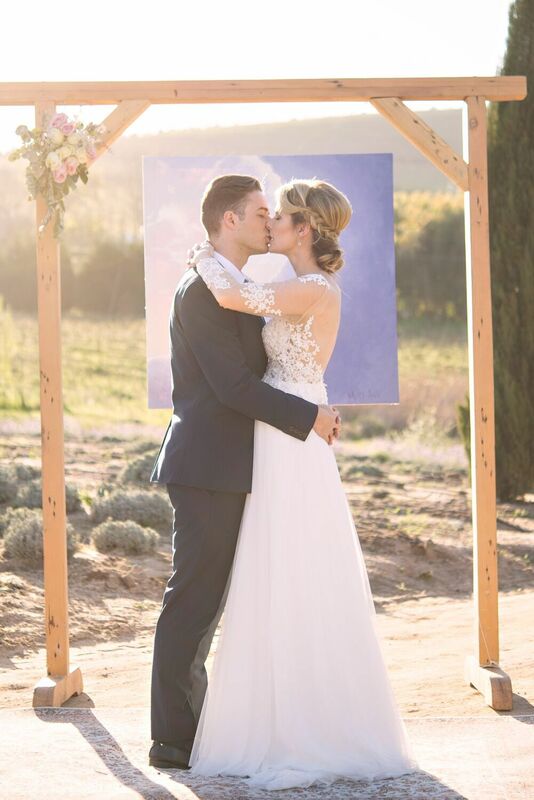 What an absolutely beautiful shoot. It’s incredible how accurately the impressionist ambiance is evoked in the photography. 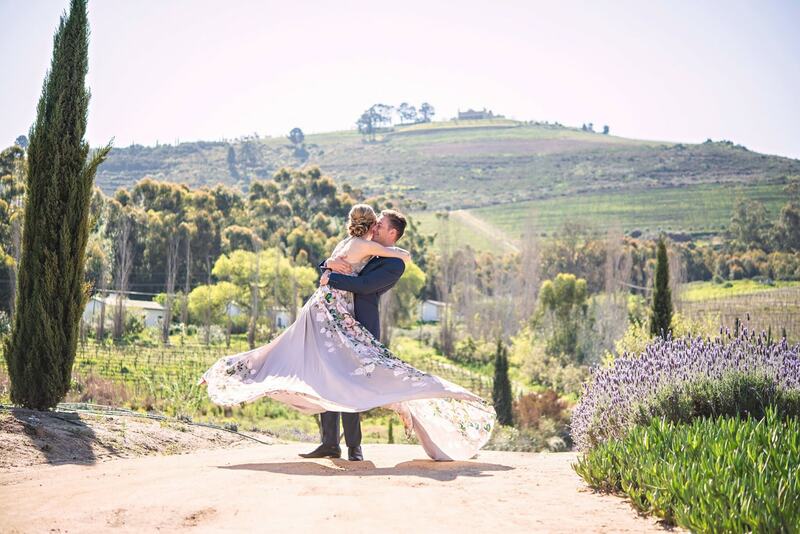 The bride’s floral dress is such a stunning, delicate thing and her wedding gown is nothing short of gorgeous. 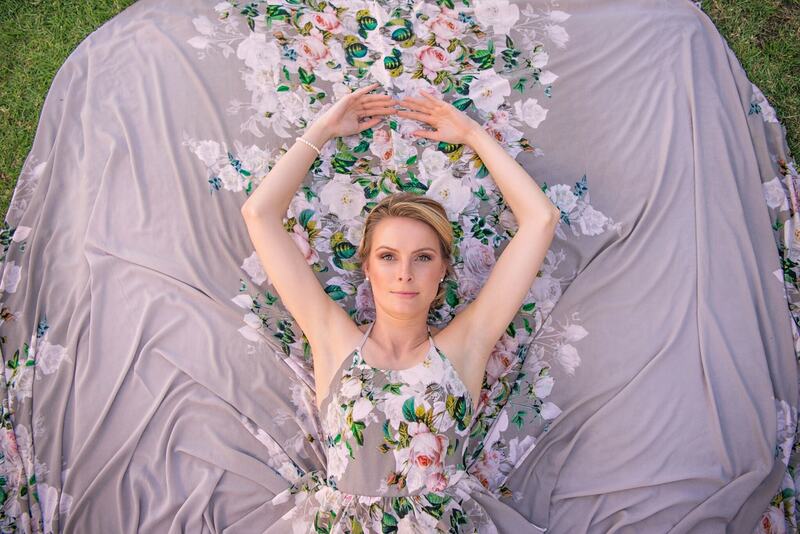 Thanks so much for sharing this inspiring shoot!